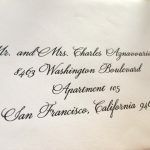 “Savoy” Font Style Calligraphy for Wedding/Event Envelope Addressing is another elegant font style for guest addressing from Hyegraph Invitations & Calligraphy. This example of addressing is in three lines. The return address on the back of the envelope flap is also in matching Savoy Font Style Calligraphy. The ink is black ink and the envelope is white stock. Depending on your wedding/event invitations or announcements you can have cream/ecru or another color matching your wedding/event colors. However, the classic color for envelopes is still white or ecru/cream stock. And even though I print a lot of envelope addressing for my clients, still black is the classic form of ink color for envelopes. 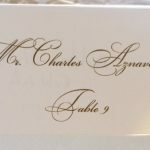 The Savoy Font style is very elegant and would make a great font choice for a fun envelope addressing. You can see more of our font selections on our Calligraphy & Envelope Addressing Pages. For Wedding Invitations see our Wedding Invitations Page. 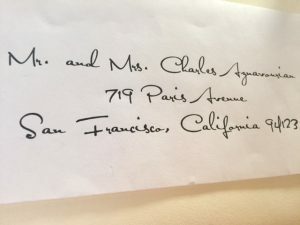 For more Calligraphy Envelope Examples see our Calligraphy Posts on our Hyegraph Blog. For Questions and Inquiries please don’t hesitate to Call, Email or Stop by our store. Prices for Calligraphy for Envelope Addressing Service is $1.00. Please see our Testimonials Page for Happy Customers. Thank You for considering Hyegraph Invitations & Calligraphy for your Calligraphy & Printing options.